Ginseng - perennial herbaceous plant family kalievyh; grows in the far East, North-East China, the Korean Peninsula, Japan, and North America. 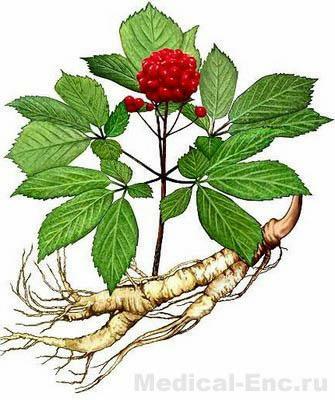 Drugs of ginseng root (Radix Ginseng) is used as a tonics in hypotension, fatigue, neurasthenia. Assign inside to food in the form of infusions (15-25 drops 3 times a day), powders or tablets (0.15 - 0.3 g 3 times a day). Cm. also Stimulants nervous activity.